With its rugged structure designed to achieve multiple life cycles under the toughest operating conditions, the 814K delivers high production operation in applications like utility work at mines, heavy civil construction backfilling and grading work, and ground preparation and subbase work on airport and commercial projects. The new Cat 814K wheel dozer from Caterpillar features a sound-suppressed cab, efficient power unit and transmission drive, and centralized service station configuration to drive machine uptime and operator productivity to new levels. With its rugged structure designed to achieve multiple life cycles under the toughest operating conditions, the 814K delivers high production operation in applications like utility work at mines, heavy civil construction backfilling and grading work, and ground preparation and subbase work on airport and commercial projects. 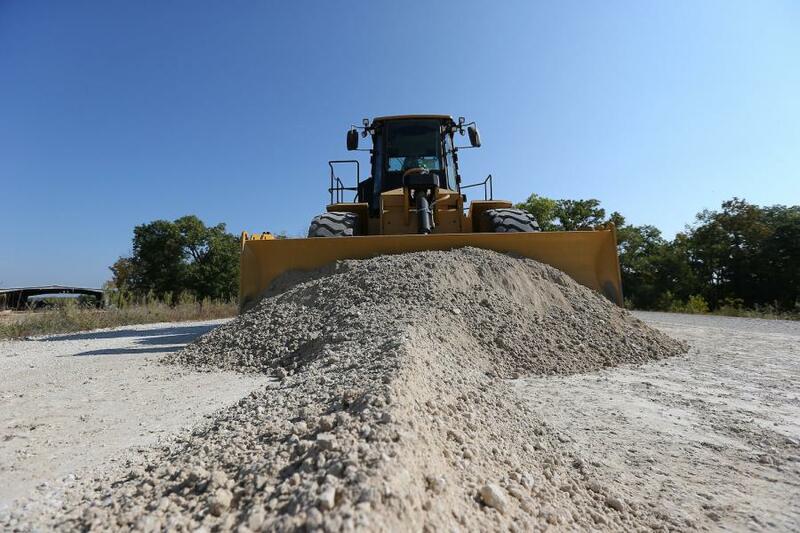 The wheel dozer's upgraded cab design makes the operator's workspace more comfortable and provides for more efficient machine operation, according to the manufacturer. Isolation cab mounting plus seat air-suspension safeguard against machine vibration feedback to the operator. The quiet cabin reduces operating noise levels to just 71 dB, compared to 78 dB of its predecessor, with a sound-suppression package option to lower sound levels to 70 dB. Cab entry/exit is facilitated through integration of the new fold-up STIC (steering and transmission integrated control system) armrest. STIC delivers maximum machine responsiveness and control plus smoother, faster cycles, while minimizing operator movement to reduce fatigue. Simple side-to-side movements turn the machine to the left or right, and gear selection control is operated through a finger-controlled rocker switch. Removal of the steering wheel console vastly increases operator space and improves forward visibility of the work area. The 814K wheel dozer offers a newly upgraded touch screen information display for intuitive machine control. The new panel displays critical machine operating data such as system temperatures, fuel use and machine hours. The dozer's new vital information management system (VIMS) allows technicians to connect directly to the machine to access a wide range of sensor information and expanded machine data. This allows managers to create productivity reports, identify operator training opportunities, see data logging of machine parameters and diagnostic codes, and monitor machine health. Cat Product Link offers remote access of machine operating data through the easy-to-use VisionLink interface to facilitate fleet management. The 814K is powered by the Cat C7.1 ACERT engine meeting U.S. EPA Tier IV Final and EU Stage IV emission standards, or Brazil MAR-1 emission standards equivalent to Tier III and Stage IIIA to meet global emissions standards. Featuring engine idle shutdown and auto idle kickdown to avoid unnecessary idling, the new field-proven engine boasts lower fuel consumption than with previous models. Load sense control hydraulics provide on-demand hydraulic flow required by the implement and steering system to further improve fuel efficiency and deliver increased rimpull. Offering four forward and reverse speeds to match application demands, the wheel dozer boasts the best-in-class Cat planetary powershift transmission, designed specifically for the most demanding mining applications. Through the Cat-exclusive advanced productivity electronic control strategy (APECS), the new 814K delivers consistent and smooth shifting, even when under load. APECS results in no loss of momentum on slopes during gear shifts, so the dozer climbs grades more efficiently and with less fuel burn, according to the manufacturer. Two Cat blade design options offer rugged durability and excellent dozing and rolling characteristics. The 3.72-cu. yd. (2.84-cu m) straight blade delivers high production dozing on stockpile material and general earthmoving projects. Alternatively, the 13.8 cu. yd. (10.5 cu m) coal blade provides precise and productive dozing, while helping to retain load control with increased capacity for lighter materials. The 814K wheel dozer includes a host of features that reduce service time to maximize machine uptime. The machine's new centralize ground-level service area provides quick access to the master disconnect switch with integrated lock-out/tag-out, DEF purge lamp for Tier IV Final/Stage IV engines, circuit breakers, emergency fuel shutoff switch and jump start receptacle. Grouping of grease points for steering, hitch and rear axle trunnions along with easily visible fluid sight gauges reduce time spent on daily maintenance requirements. By providing the operator with real-time operating data, VIMS system notifications alert operators and technicians of machine issues, so they can be quickly addressed before experiencing a significant downtime event. The machine's new high efficiency hydraulic filtration results in cleaner hydraulic oil to increase component life and extends the oil inspection requirement by 50 percent, from 2,000 to 4,000 hours. Railings, ladders and non-slip surfaces for platform level access points help to enhance technician safety when working on the engine and cooling system. The Cat 814K wheel dozer is currently available for worldwide orders.